Okay. I think I’ve sat staring at this computer screen for about 30 minutes trying to come up with something to write about. I always struggle with this – I don’t feel like my life is particularly interesting at the moment, I’m not running and I haven’t run regularly in more than a year, I work out nearly every day doing CrossFit and I love it, but I never know how to talk about it. All of this is to say, I feel like I’m in a writing rut. So today, we’re going to talk about this week’s workouts, because I can actually write about that. Currently, crossfitters are in the middle of the CrossFit Open – a worldwide competition that tests your fitness and your skills, and gives you a benchmark to compare your progress against. This is my first year doing the Open, though I’ve followed it for a number of years. Being a competitive person, I knew going into the Open that I wanted to push myself to do well. That being said, I also knew that if I let myself get too competitive, I would only end up getting stuck in the cycle of anxiety about the workouts, and then disappointment in my overall result. I’m relatively new to CrossFit, I’m still learning a lot of the higher skill movements, and I have quite a way to go to become proficient at many of the movements I can do. Things like handstand push-ups, handstand walks, muscle-ups… all things that I’m working on improvement and all things that have shown up so far in the Open. It’s been an empowering and humbling experience all at the same time. We have one more week to go and the last workout will be announced tomorrow. It will probably be some wicked form of torture, but it’s the last one, so I’m going to give it all I’ve got. I did last week’s Open workout on Thursday as part of our gym’s Thursday Night Throwdowns – where, after the workout is announced, a handful of our athletes complete the workout in front of our friends and workout buddies. I was pretty amped and nervous about doing this because, like I say, I’m pretty competitive and I hate failing at anything. I was really hoping for movements that I could do and would have really preferred a heavy barbell. When the workout was announced, I was really happy – in nine minutes, we were to complete 21-15-9 reps of deadlifts (155 pounds for women) and handstand push-ups, followed by another 21-15-9 of deadlifts (205 pounds for women) and 50 ft handstand walks. I got through 70 reps that night, making it through 21 deadlifts, 21 handstand push-ups, 15 deadlifts, and 13 handstand push-ups. I love deadlifts, but while I like the push-ups, I’m still learning how to be more efficient at them as well as strengthening my shoulders to be able to lift my body weight off the floor. After resting on Friday, I decided to re-do this workout on Saturday, attempting a different strategy (breaking up the push-ups earlier and managing my rest better). The second time, I got 12 more reps – finishing the round of 15, getting 9 deadlifts and 1 more handstand push-up. I was ecstatic with that, especially given how sore my shoulders were from doing it two days before. Headed to the gym for SpinFit Sunday morning – this class is similar to spin, but uses a bike erg instead of a traditional spin bike. I followed this up with a 5×5 back squat set, working at approximately 70% of my max. My legs were pretty smoked by the time I finished. Build to a heavy thruster. I worked up to 165#. I stuck around for the class, as well, and did that workout, too, as it was all skill work, specifically rope climbs. I can do these, but under fatigue, they get really hard. It was good to practice these with how tired I already was. Rest day is on the horizon and I am SO looking forward to that. Clay also gets home from more than a month and a half away in a few days, so things are looking brighter for sure. Now, if winter would GTFO of here already, I’d be really happy. 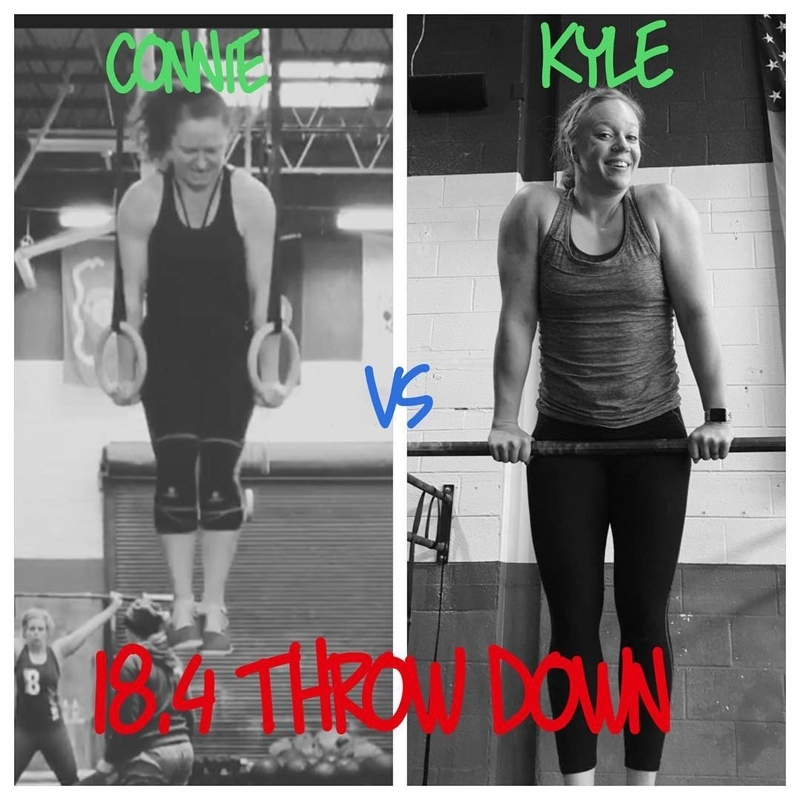 This entry was posted in Workouts and tagged 18.4, crossfit, crossfit kingstowne, crossfit open, gym, kyle, workouts. Bookmark the permalink. You are such a badass lady.